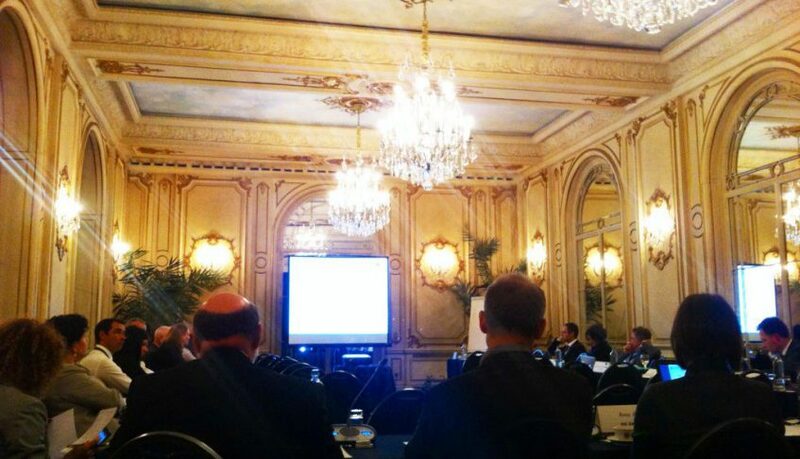 On Thursday 14th April the European Innovation Partnership (EIP) on Raw Materials Operational Groups meeting took place at the Plaza Hotel in Brussels. During this one day-meeting, several projects and initiatives have been presented during plenary and parallel sessions, including the MICA project introduction followed by a round table debate. The Mineral Intelligence Capacity Analysis (MICA) project was introduced by Lorenz Erdmann, Coordinator at the Fraunhofer Institute for Systems and Innovation Research and leader of the MICA WP2 “Stakeholder needs”, at the Operational Group Knowledge Base. As highlighted, the projects main goal is to provide stakeholders with the best possible information, in a seamless and flexible way using an ontology-based platform European Union Raw Materials Intelligence Capacity Platform (EU-RMICP). The platform will be able to respond to the specific raw material knowledge needs of stakeholders. MICA will last 26 months involving 16 partners and 15 linked third parties (all Geological Surveys). Most importantly, MICA’s contribution was introduced to the EIP Strategic Implementation Plan: MICA will combine the available data and knowledge on raw material sources (including recycling) and make them easily accessible. Intelligence is a first requirement in order to reduce import dependency, diversify raw material sourcing, to find alternatives for (critical) raw materials and to put Europe at the forefront in the raw materials sector. Therefore MICA represents an important step to fulfil one of the Strategic Implementation Plan’s (SIP’s) targets: “European raw materials knowledge base with information, flows and dynamic modelling system for primary and secondary raw materials”. Several potential areas of cooperation between MICA and other projects (MIN-guide, MINLEX, MINATURA2020, JRC RMIS) were also presented to ensure that the projects complement one another. Questions such “Can one project be so inclusive to cover all intelligence parts?” and “How do you feed this database in the long-term?” and cooperation needs to create synergies with ongoing initiatives were discussed. The maintenance issue of EU-RMICP was another aspect that was debated. MICA is a Horizon 2020 funded project, with a focus on a specific target. However, the project has a long term perspective, as it is expected to feed into the ERA-NET on Geosciences that will cover three main areas: mineral resources, energy and water resources.